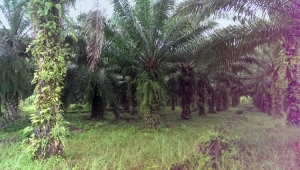 For several decades, palm oil cultivation on a commercial scale in some south-east Asian countries has resulted in a very serious impact on the natural environment, causing widespread deforestation and loss of natural habitat and threatening critically endangered species such as the Asian elephant, orangutan, Sumatran tiger, gibbons, hornbills, and other organisms that are trying to survive in the wild. Egypt dating back to 3,000 BC. 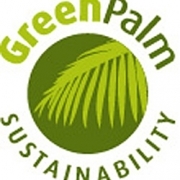 But it was in the 19th century that palm oil suddenly became widely used in Europe and America as an industrial lubricant and cooking oil, and as the basis of many famous household products ranging from soap and toothpaste to ink and pizza dough. 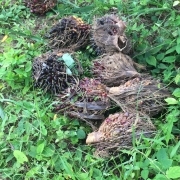 The oil comes from the red pulp of the fruits which are small and oval and grow in clusters of several hundred, close to the trunk on short heavy stalks. The fruit is black and red when ripe, and is fibrous and oily around a white kernel that is also rich in oils. 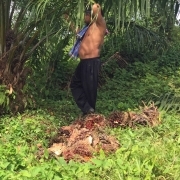 Because the oil palm trees produce fruit continuously throughout the year, with new bunches ripening each month, the fruit is always in season. A very sharp knife is used to cut off the fruit bunches. As the tree grows, it develops a very thick, distinctive scaly trunk, and large spreading crowns. 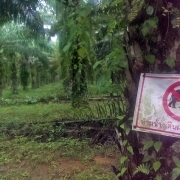 Nowadays in Thailand most of the oil palms are cultivated on smallholdings that practice sustainable cultivation. 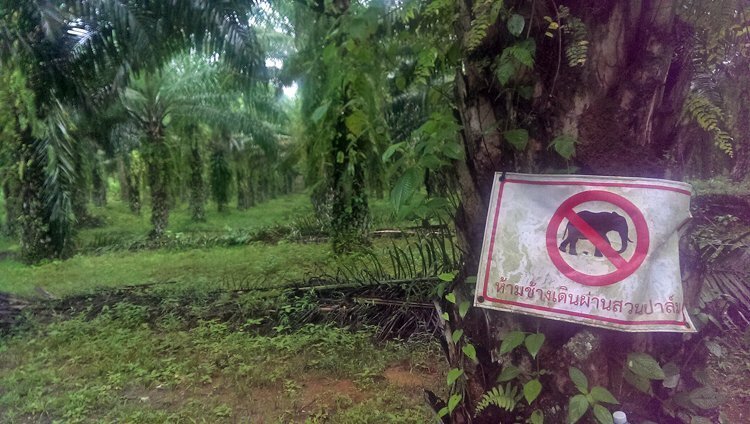 The picture is not so rosy in some other countries but at last big companies are coming under a lot of international pressure to ensure their palm oil production is sustainable. In some places, farmers, whose lives depend on the crops, will try to discourage elephants from eating their plantations and in extreme cases may even try to poison them. Please help us in our education mission. Your donation, however small, is seriously important to us. If you can, please click here.